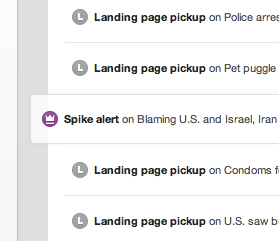 Brace yourself: The right side of your Newsbeat dashboard just got a lot more action. We’ve launched Event Stream, a ticker-like feed of your site’s happenings as they occur. 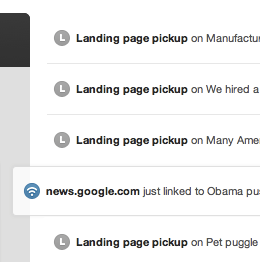 Think of it as “Breaking News: Your Site!” Think of it as ultimate real-time. With Event Stream, you’ll be able to see the moment when Yahoo News picks you up, so you can raise the flag to the front-lines to prep for the ensuing traffic rush. And you’ll see when your colleague hits her highest traffic numbers ever, so you can be the first to throw her a high-five across the cubicle wall. And you’ll see a spike alert the second it happens, so you don’t miss the opportunity to boost that article on social media or create more content to support it or double-check that all those related links are ready to rock. Basically, you’ll see everything that matters when it matters. All you need to do is hover over those little gray circles and the Notable’s information will appear. Our hope is that you use Event Stream and Notable Events to stay on the pulse of all the things that make your site tick. 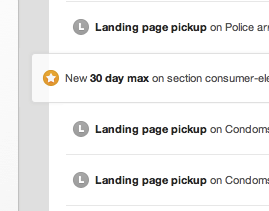 They should keep you even more informed on what important events on your site require you to take instant action. As always, we want to know what you love about this feature and what you want to make sure we keep in mind for future releases. Let us know what you think: support@chartbeat.com.